Phobos just can’t catch a break. 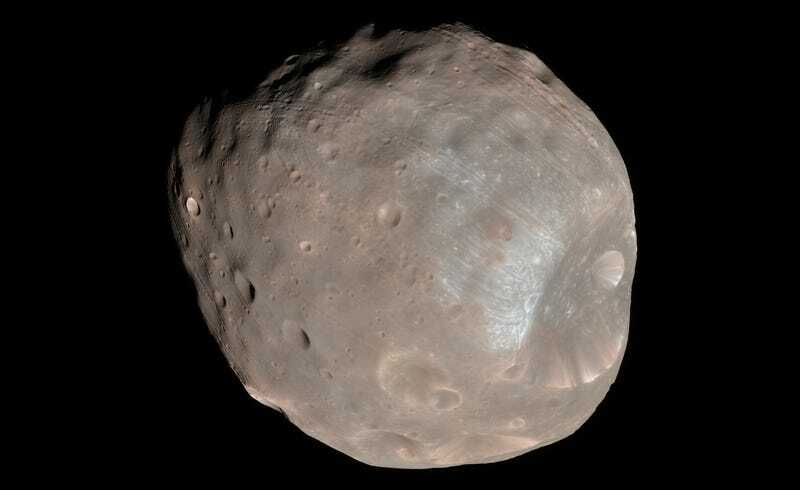 Not only is Mars’ lumpy, crusted-over dust bunny of a moon destined to be ripped to pieces in ten million years, it seems the poor thing can’t stop punching itself. Not literally, of course. But it appears that a series of mysterious scars and crater chains on the battered Martian moon of Phobos are self-inflicted. That’s according to new computer models published today in Nature Communications, which show how these features are produced when escaped chunks of Phobos rain back down the surface. Since NASA’s Viking spacecraft snapped the first close-up photos of Phobos in the 1970s, scientists have puzzled over a motley collection of markings on the tiny Martian moon. At first, the features were taken to be tidal scars caused by the gravitational tug of the Red Planet slowly reeling Phobos in toward a spectacular death. According to Nayak, this process of repeated, self-inflicted injury is a relatively recent phenomenon for Phobos. His models show that when the moon was in a higher orbit, ejected material would have had more time to disperse before returning to the surface, and it wouldn’t have formed distinct linear chains when it did. “We think this process started when Phobos crossed the Roche limit about ten million years ago,” Nayak said, referring to the theoretical point at which a moon should be pulled apart by the gravitational tug of its planet. That’s good news from a scientific perspective, because geologically younger markings are easier to date. Nayak hopes that in the future, all of Phobos’ craters can be mapped and dated at a high resolution, allowing astronomers to reconstruct the moon’s history in detail. There are still many open questions about this strange, doomed moon. Did it form in place during a giant impact, or is it a captured asteroid? When it disintegrates, will it produce a spectacular ring? Is Phobos an abandoned alien spacecraft, or a fossilized Cadbury egg? In that ruddy, battered surface, the answers are waiting.